It is likely that this week is the turn from a soft blue trend in the election campaign, which is turning into a referendum on the Trump presidency, in to a clear red confirmation. The patient strategy of Republican majority leader Mitch McConnell and Judiciary Committee chairman Senator Chuck Grassley seems to be accommodating demands that Christine Blasey Ford get a fair hearing without giving away so much time that it is too late to confirm Judge Kavanaugh before the Senate rises for the election campaign. The appearance this week of the uncorroborated, much scorned, revenant vision of one Deborah Ramirez, who claims that Mr. Kavanaugh exposed himself to her while they were freshmen at Yale 34 years ago and both were drunk, and that she inadvertently touched the future judge's tackle as she made her escape, was too much even for the New York Times, and it was handed off to The New Yorker. The immense literary history of the latter publication is besmirched by this taking of the Times' leavings and inflicting an ancient bibulous phallic fantasy on its readers. 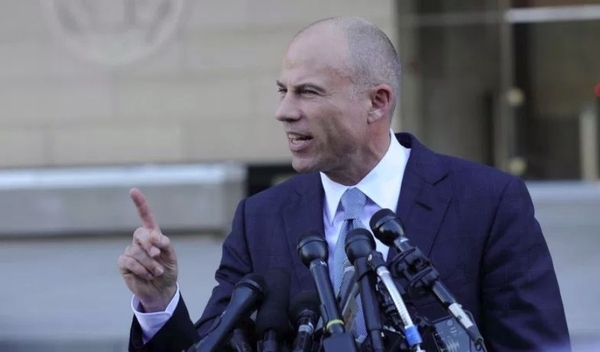 Even worse for the Trump-haters was the rat scrambling against the traffic and running up the hawser of the sinking ship, as the egregious Michael Avenatti portentously announced that he had excavated another Kavanaugh victim whom he would unveil shortly. Throwing this naughty fairy tale and the most obnoxious poltroon in America into the hopper, as Dr. Ford prepares finally to testify, simultaneously defangs the reasonable feminists who don't want the Ford story to go unheard but don't have a closed mind against Kavanaugh and dilutes the credibility of the anti-Kavanaugh forces to a point where the wobblers in the Republican ranks should be steady enough. Senators Collins, Corker, Flake, and Sasse seem to like Kavanaugh more than they dislike Trump, and on an issue where the Republican party is almost united, breaking ranks at this point, unless the Kavanaugh position is legitimately undermined, would be seen by everyone as malicious: acting out their hostility to the president at the expense of a distinguished judge fighting for his reputation against unworthy calumnies. Avenatti was a Rahm Emanuel political operative when a law student, went bankrupt as a lawyer, and appointed himself the counsel for Stormy Daniels. He was reduced to crowd-funding to try to pay for his self-publicizing tour as he tried to blackmail the president. There is no place for such a charlatan in the confirmation procedure of a nominee to the U.S. Supreme Court. As this has played out, there has also been the latest sequence of tremors under the once daunting façade and edifice of the U.S. Justice Department and FBI. It is not clear exactly what Deputy Attorney General Rod Rosenstein was doing and saying in the conversations with fired FBI deputy director Andrew McCabe and former senior FBI agents Peter Strzok and Lisa Page, in which there was a reference to wearing a microphone to record the president's words in contemplation of invoking the 25th Amendment, by which a vote of the vice president, the cabinet, and two thirds of both houses of Congress could declare a president mentally or physically unfit for the exercise of that office. It has never been used, though it was considered when President Reagan was under anesthetic because of the assassination attempt on him in 1981, but he recovered so quickly, it was not necessary. Some Democratic unofficial spokespeople such as Watergate mythmaker Carl Bernstein have bandied it about as a remedy for the "constitutional crisis" of President Trump's obvious mental imbalance, as if this were a reenactment of the Madness of George III. The whole concept is absurd, a non-starter of epic unfeasibility. This already surrealistic idiocy was amplified by Amnesty International's calling for Kavanaugh's withdrawal for violating human rights. The president has said that he will consider Rosenstein's position, and Rosenstein is reported to have said that this was a joke conversation, and obviously that that was all it was. The fact that the New York Times, which drew the line at the Ramirez idiocy has run with this story, makes it slightly more credible. But it does not overcome Rosenstein's right to a presumption that he would not, with others, contemplate any such insane enterprise as invoking the 25th Amendment. Rosenstein recommended the firing of former FBI director James Comey, signed an improper FISA warrant renewal in respect of Trump campaign aide Carter Page, and has a great many unsustainable conflicts of interest in likely or pending litigation, including the appointment of Robert Mueller as special counsel, his own and Mueller's role in the Uranium One–Clinton Foundation controversy now being examined by special counsel John Huber, and in anything to do with consideration of whether a case can be made against the president for obstruction of justice. (It can't from anything that is public, but that does not entirely excuse Rosenstein.) He is under an impeachment motion from the House of Representatives, and his willful withholding of vital information from the Judiciary and Oversight committees of the Congress has been an outrage. It is difficult to see how Rosenstein can continue. He will only see the president on Thursday when the president returns to Washington from speaking to the United Nations and meeting many world leaders. When his departure was floated as a trial balloon in Washington on Monday, it did not draw a very energetic reaction, even from Democratic radicals such as Adam Schiff, who could manage only a feeble reference to Richard Nixon's Saturday Night Massacre of 1973. (The attorney general, the deputy attorney general, and the special prosecutor were all fired or resigned then in vastly different circumstances to these.) Whether Rosenstein goes or stays, the justice system is becoming steadily more accountable to the Congress and the president, not to stifle Mueller, but to facilitate the clean-up of the FBI and plumb the depths of the politicization of the Obama prosecution service and intelligence agencies, a form of misconduct for which 90 percent of Americans would have zero tolerance, if the facts could be deduced without partisan taint. While pursuing that Holy Grail, the pressure on the president should ease. The country is becoming accustomed to him as president, even if reluctantly, and it is obvious that he will only cease to be president when he or the voters or the two-term limit determine. As cant and emotionalism subside, his presidency can be seen as substantially successful, and we are a long way from the frenzy, disbelief, and scorched-earth obstruction of two years ago. The crisis is passing.